Top-performing Coursera students share their advice on course success. Get the most out of your course experience! Jot down notes like: “I want to move ahead in my career” or “I want to improve my skills as a chef.“ Post your answers on a refrigerator, bathroom mirror, computer screen so you can see them daily to spark persistence. Open your calendar and choose a predictable, reliable time to dedicate to watching lectures and completing assignments. Set up a block of time, look ahead and if there are sessions you may miss, adjust accordingly. Our studies show that students who pass these first milestones are much more likely to complete the course. 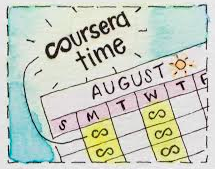 Before and during the course, your instructor will send out emails that might include reminders about upcoming deadlines, announcements of changes to the course schedule, or links to helpful external resources. Anecdotal evidence shows that learners are more likely to succeed if they participate in course forums. Be sure to ask questions about assignments, discuss topics, share resources, and make friends. Students often form study groups based on native language and interest areas. If you don’t see a group that fits your needs, start one by posting a new thread outlining your interests and goals, and invite others to join you! Earning a Verified Certificate has a deadline. Not only can you get a credential that can verifies the work you’ve completed from a university partner, but it makes you be on track. Tell your friends about the course, post achievements to your social media accounts, blog about your homework assignments. Having a fan base to cheer you on makes a difference. 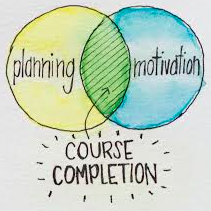 If you get distracted with obstacles like family, friends, work or an unexpected life event, consider how you will keep up with your coursework. Predicting upcoming roadblocks and adapting accordingly is one of the best strategies for reaching any goal. Learn anytime, anywhere! With the Coursera Apps for iPhone, iPad, and Android you can even download videos to watch lectures offline. Bookmark your course page, grab a notebook or digital app for notes (we like Evernote), a webcam, and collect any instructor-recommended materials. Got more tips? Leave them in the comments below or Tweet to us @Coursera, #courseratip.